Amy Tintera’s debut, REBOOT, in which two teens who have “rebooted” after dying must work together to rescue their kind from enslavement and end up falling in love in the process, to Kari Sutherland at HarperTeen, at auction, in a two-book deal, by Emmanuelle Morgen at Stonesong. Vast is proud to announce that it’s untitled Scott Stuber television series has been picked up by NBC. Vast’s feature film The D.U.F.F. with McG has been picked up by CBS FILMS. Vast partners with Fox TV Studios and David Madden on a television series based on bestseller Anne Perry’s “William Monk” novels. Jonathan Prince is the showrunner. McG is going after “The DUFF,” optioning feature rights to Kody Keplinger’s coming ­of ­age novel to produce through his Wonderland Sound and Vision with Vast Entertainment. McG will produce with Vast Entertainment CEO Lane Shefter Bishop. Wonderland’s Mary Viola will exec produce. “DUFF,” which stands for Designated Ugly Fat Friend, focuses on a 17-­year-­old high school student who realizes she’s the epitome of “Duffness” and subsequently struggles with maintaining her sense of identity while juggling a tumultuous home life. It is the debut novel by the 20-­year-­old Keplinger and will be released this fall by Poppy. 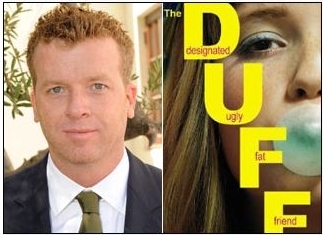 “DUFF” was featured at last week’s BookExpo America on the Young Adult Editors’ Buzz panel. Vast Entertainment is producing the feature films “Ghost Keepers” with Sid Ganis’ Out of the Blue Entertainment and “Stray” with Evolution. It is also producing “Savannah Reid Mysteries” skein for Lifetime and telepics “Girls Guide to Witchcraft” for ABC Family and “Fringe Girl” for Disney Channel. Vast teams up with International best-selling author Anne Perry, to create a new television series based on her William Monk Mysteries. Perry’s sold over 20 million books world-wide, has received international acclaim, and since she began writing in 1979, none of her novels has ever been out of print. 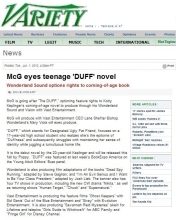 McG’s Wonderland (producers of The O.C., Supernatural, Chuck, the Charlie’s Angels films and the upcoming 20,000 Leagues Under the Sea) is partnering with Vast Entertainment on the teen angst comedy-drama The D.U.F.F. as a feature film project. Vast Entertainment is moving briskly on developing the Robert Tanenbaum books into a network television series. Tanenbaum is the author of 23 best-selling novels, and is pleased to be partnering with Vast on the project. Vast Entertainment has begun work on the pilot script for the Lifetime Entertainment Television series The Savannah Reid Mysteries with writer Siobahn Byrne (Law & Order: Criminal Intent, Monk, Third Watch). The series is based on a series of fifteen novels about voluptuous Georgia-born private investigator, Savannah Reid, whose food cravings come second only to her appetite for adventure. Sandra Brown, author of 57 NY Times bestsellers, has sold the option on her 1996 legal thriller, The Witness. It’s the first time in her 27-year career that Brown, who has 70 million copies of her books in print, has made a movie deal.